After a long and murky process, Kevin Rogers is Boston College's new Offensive Coordinator. Rogers comes to BC with a long track record and it will be interesting to see how he puts his imprint on BC. Let's get to know him a little better. Like Dan Henning, Rogers graduated from William & Mary, where he played Linebacker. Because they hit some hard time fans forget how cutting edge Syracuse's 1990s offenses were. Rogers was a key part of that innovation. The Orange were the first to combine and execute with any consistency Pro-style passing with Option elements. As the QB coach and key recruiter, Rogers developed Marvin Graves and Donavan McNabb. In the two years that Rogers called plays for that offense, the Orange won the conference both years and led the conference in total offense both seasons. McNabb also led the league in total offense. Rogers was a shining star. In 1999 he joined Bob Davie's staff as OC and QB coach. The Irish implemented his passing into their option offense and increased their efficiency, ranking 19th nationally. Jarious Jackson had his best statistical year yet but Notre Dame suffered a losing record. In 2000 the productivity declined a bit. Notre Dame had a deadly ground game but was a total mess at QB. Reminiscent of BC's 2010 season, Rogers used three different raw QBs trying to find something that worked. In 2001, the QB shuffle continued (only with Caryle Holiday in the mix this time) and the offense fell apart. Bob Davie and his whole staff were fired after the season. After Notre Dame, Rogers joined Virginia Tech as QB coach. He did not call plays there, but was credited with developing Bryan Randall. He also was responsible for baby sitting Marcus Vick. Vick had good productivity but also was a major distraction. Supposedly Rogers became fed up with the situation after Vick stomped on Elvis Dumervil in the Gator Bowl. 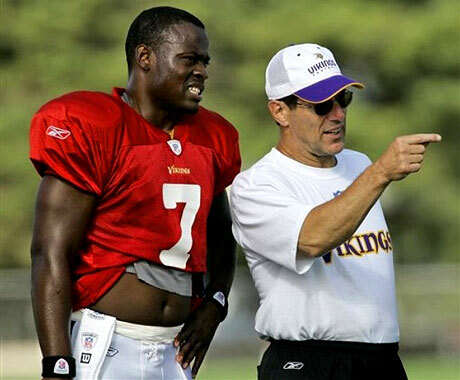 He joined the Vikings as QB coach. Rogers time with Vikings doesn't tell us much. The whole Childress/Favre situation obscures any imprint we could derive. He kinda/sort helped develop Tarvaris Jackson. For what it is worth, one of the first things Leslie Frazier did upon becoming head coach, was fire Rogers. This is a guy who has recruited in the Northeast. He's recruited in the ACC. He's been away from the college game for a bit, but has a deep history to mine in his return. He's coached at schools with recruiting restrictions. He's called plays and led some very productive offenses. At one point he was one of the most innovative minds in college football. Plus he is a character guy who everyone seems to respect. Look at the list of quarterbacks Rogers has developed at the college level. Do any of them remind you of Chase Rettig, Christian Suntrup or even Dave Shinskie? He has never really relied on the classic pocket passers. His philosophy of over recruiting the QB position and seeing what sticks is more inline with Jags/Logan than the TOB/Spaz way of picking "one guy" each class. Rogers hasn't called plays in nearly 10 years. He has never worked with any of the current BC staffers. How Notre Dame fell apart in 2001 was very disconcerting. His offense is no longer unique. Rogers is a big improvement over Tranquill. He was not my choice but I think he can still be serviceable. My biggest concern is his ability to adapt his offense to the personnel we have in place. I also wonder how he will work with the staffers we have in place. Staff chemistry is an underrated aspect of college football. I think we have some good guys on the offensive side. I hope they will work well with their new boss. I will have more from Notre Dame folks later this week. As I've said, I have real concerns about the process that landed us Rogers, but that is not his issue. That is a BC issue. The past two years have been frustrating to watch. If Rogers changes that, we will owe him a big thanks. My memory isn't great, but McNabb was much more of a classic pocket passer than an option guy at Cuse, at least compared to Vick and the others. Not that he wasn't mobile. Any speculation as to why Rogers was dismissed at Minnie? If I was a new coach of the VIkes, I'd want to make it as unappealing for Favre to want to return, honestly. Getting rid of the QB coach would be part of that. McNabb ran for more than 400 yards in each of his final three season at Syracuse. He was a great college QB and a deadly weapon running and throwing. Rogers deserves credit for that. ATL, do you think we will lose Ryan Day over this? Being looked over? Or is he more of a Spaz type that will stick. "Rogers hasn't called plays in nearly 10 years"
In all honesty, how could the offense be the same or worse this under anyone? There is nowhere to go but up. Lets just hope that we're way up, not just incrementally up. A small improvement would be a failure in my opinion. rogers was the QB coach for the best professional year of brett favre's career. that speaks for something, no? also, favre at age 39 & 40 was not a scrambling QB. rogers adjusted the offense for favre, seemingly. vikings relied a lot on the run, which BC should do next year with montel and andre. getting a coach with NFL experience is always a plus. mod34B i'm perplexed as to what you wanted. you didn't want day and yet you assail a guy who's coming from the NFL. Rogers hasn't "designed or implemented an offense in 10 yrs." (A) what does this even mean? (B) how do you know? you were privy to what this guy did with the vikes? gimme a break. i think this was a good job by Gene to actually do a search. i'm willing to see how rogers does, and like nick says, the offense simply cannot be any worse than it was last year. 8-0 heading into nationally televised FSU game! but, nothing is ever for certain with this team... could be 5-3 or 3-5 who knows! The hire of Rogers looks good but who knows. Here in St. Louis, Christian Suntrup is coming in and is pretty much a "pocket passer". Chsse Rettig appears to be as well as is or was David Shinskie. It will be interesting to see what "shakes loose". At least, there is optimism with bringing in a coach with pro experience. This should excite Rettig and Suntrup. Shinskie may as well "pack his bags", sad but true. The fact that Rogers has worked with wonders with mobile QBs (yet still pass-first QBs) is no cause for Concern. Coughlin was the OC for Flutie, and killed it using Foley. The fact is Rogers QBs have excelled, and being an OC is half about coaching QBs, half about in-game play calling. I'm just glad we have a guy who's proven able to develop QBs ... in a pro-styled passing game ... yet still keep to a run-first style.